Cold weather leave you chilly? 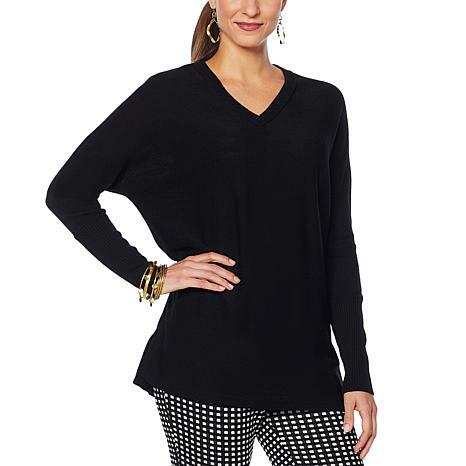 Well, get on with the days and nights looking chic in this sweater! Im so glad to see this brand brand on TV. There fabrics on still of great quality and this sweater does not disappoint in any way; style, fabric is perfect weight, soft and comfy, colors are saturated (I got grey and wine colors), length and fit. Would have purchased if there was a chocolate brown, red and deep purple. Only recommendation I have is to make it tagless in neckline. Nice material that I think I would have enjoyed. I ordered my usual Medium, and it was more like a 2XL. Order down a size or two, or exped to pay that lovely return shipping! Purchased this sweater in the blush rose color. It is a pretty color and I like the way the sweater fit but it catches way to easily! I was writing with a pen and it pulled the front of the sweater (bizarre) and when I took the sweater off, there were pulled spots on the back and shoulder area. It is not worth the price and if it didn't already look like I've worn it every day for a month, I'd send it back! And I've only worn it once! Fitted turtlenecks have always been alluring. Diane turns up the heat with this cold-shoulder rendition. A tasteful touch of skin, a fabulous fit — wear your best bra and take advantage of this head-turning silhouette. Some women just ooze sophistication. You will too in this classy sweater. Something about the combination of ribbed knit, colorblocking and goldtone buttons looks especially rich. It promises to become a favorite for looking casual chic any day of the week.